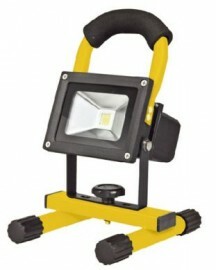 10W LED rechargeable work light manufactured with durable aluminium light housing with sturdy "H" stand. Battery 7.4V 3300mAH Li-ion batteries. Lumens flux: 800 - 900. Colour temperature 2700 - 7000K. Work Time 2.5 - 3 hours. Dimensions 16 x 17 x 22cm.